Enjoy fantastic food, grand interiors and beautiful river views at this historic country house hotel. Located in the heart of the Scottish borders, surrounded by stunning scenery, local activities include fishing, shooting, walking and cycling. Catch a salmon and the hotel will smoke it for you! Our members can choose from three room types, with a complimentary glass of Prosecco and a discount on Afternoon Tea. 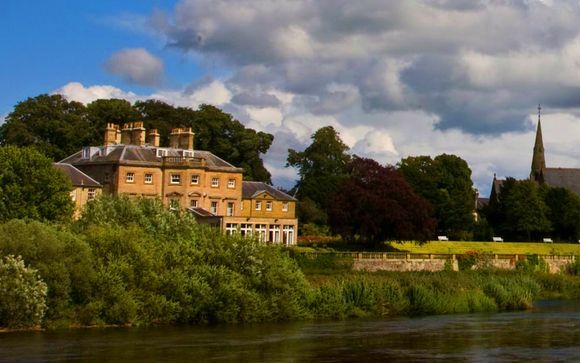 This charming hotel located in Kelso, Scottish Borders, Ednam House enjoys a unique location on the banks of the River Tweed. With the wild nature of the Scottish Borders, eagles, stags and herds of wild deer can often be seen around the hotel - a magical treat for city dwellers, so get outside and explore these amazing surroundings on foot or bicycle. Kelso is a small market town with a big personality. With its attractive market square and cobbled streets, Kelso is a favourite destination in the Borders. Visit independent boutique shops selling artisan food or jewellery and gorgeous cashmere and gifts. Peebles Arts Festival runs from 25 August – 1 September. There are also a huge number of historic castles and houses to visit in the near vicinity, which history enthusiasts will love, the closest being Floors Castle which is in Kelso itself. A 15 minute drive north of Kelso will take you to the beautiful Mellerstain house, home to the Earl of Haddington and an exquisite example of Robert Adam architecture. There is a very nice collection of furniture, paintings & decorative objects on show, not to mention the extensive grounds with a walk around the lake. Built in 1761 as a private house, Ednam House was purchased and turned into a hotel by Ralph Brooks in 1928; the hotel opened its doors to guests on the 10th of July of that year. The hotel has been owned and run by the Brooks family ever since. Although the original building has been extended and updated through the years by each generation, the many wonderful features have been retained enhancing the charm, character and unique atmosphere of this historic mansion. Today, Ralph and Anne Brooks are the fourth generation of the family at the helm of Ednam House ensuring that its wonderful heritage carries on. 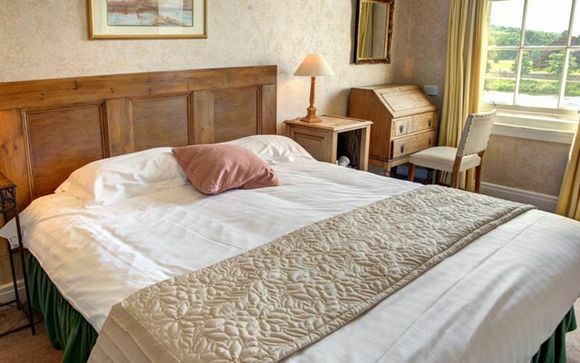 Set on the banks of the River Tweed, and surrounded by 3 acres of gardens, this elegant country house hotel has a welcoming and friendly feel, and features many quirky extras such as an on site smokehouse where you can smoke your freshly caught salmon! The restaurant is a real highlight too, championing home made produce such as honey, bread and bacon. This offer is based on a stay in a Classic River View Room. Overlooking the courtyard and driveway , these rooms offer plenty of space for a comfortable stay. Each room is uniquely decorated in a traditional style. 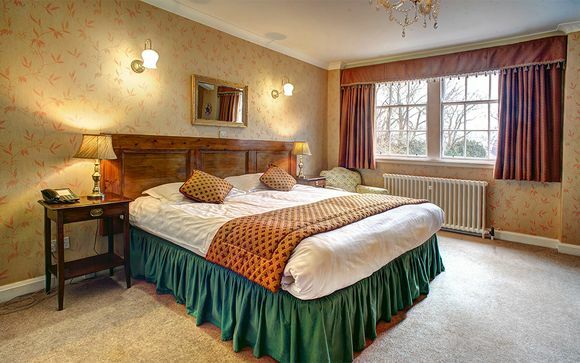 They feature a king size bed, desk, flat-screen TV, spacious closet, tea & coffee facilities and ensuite bathroom. 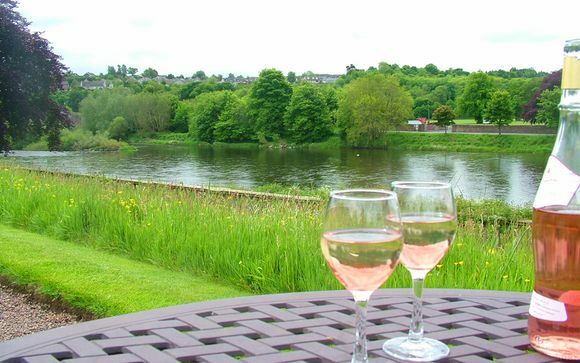 Enjoy tranquil views over the River Tweed from your bedroom in a historical setting. Each room is uniquely decorated in a traditional style. They feature a king-sized bed, desk, flat-screen TV, spacious closet, tea & coffee facilities and bathroom combining bathtub and shower. 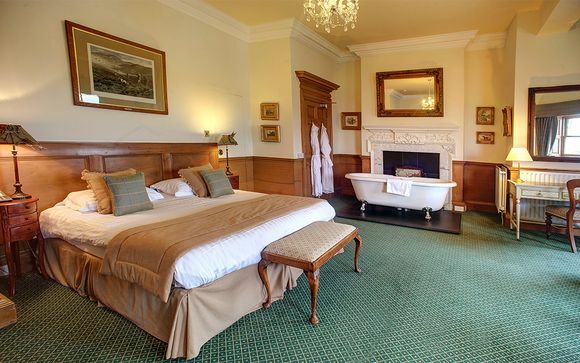 Each room is uniquely decorated with the original plaster work, marble fireplaces, and antique furnishing, and have views over the River Tweed. They feature a king or queen size bed, desk, flat-screen TV, spacious closet, tea & coffee facilities and bathroom combining bathtub and shower. Just for you: Glass of Prosecco upon arrival, and a 10% discount on Afternoon Tea. The delightful riverside restaurant offer you a daily changing menu of traditional and modern cuisine. The team strive to create simple, unfussy food that is full of flavour and showcases the best local and seasonal produce. The team produce almost all the food in-house from baking fresh bread, making jams, marmalade and ice creams, to curing their own bacon and ham and even raising their own pigs for that purpose. In addition to the freshly prepared menu, they offer a well balanced and interesting wine list. Keeping it in the family, a good proportion of the French wines come directly from owner Anne’s family who are award-winning winemakers with many vineyards throughout France. Ednam House employ a 'catch it and we'll smoke it' policy - so head down to the banks of the river on your doorstep to get fishing! The River Tweed is the most popular and prolific salmon river in Scotland and with one of the longest running seasons, from the 1st of February to the 30th of November. Scotland is world renowned for its country pursuits and the Scottish Borders is certainly one of the choice destination for shooting and stalking parties. The area offers a variety of mixed game and shooting set up, from rough walked up days to fully catered for Grouse days.